King Billy Review (2019) - Now 100% bonus up to 1 BTC + 200 spins! 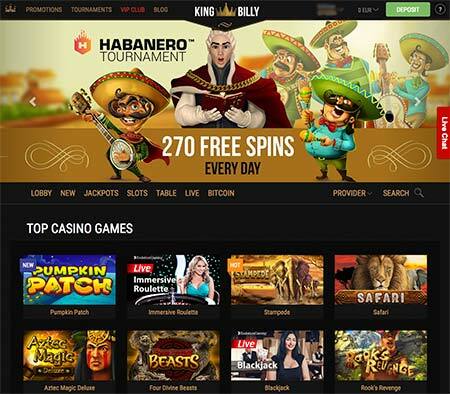 King Billy Casino is a quite new hybrid casino (accepting both FIAT and cryptos) founded in 2017. King Billy features a very good selection of casino games including huge amount of slots (1500+) and a wide selection of table games including a live casino. Low bonus wagering (35x) Join now! The deposit bonuses are also very good with quite low wagering requirements (35x). The company behind the casino is Direx N.V. and the casino license is from Curacao. King Billy Casino looks like this. King Billy is a quite new hybrid casino (accepting both FIAT and cryptos) founded in 2017. King Billy features a very good selection of casino games including huge amount of slots (1500+) and a wide selection of table games including a live casino. The company behind the casino is Direx N.V. which is running also many more cryptocurrency casinos. The casino license is from Curacao, which is not the strongest of type, but still better than nothing. This is how King Billy casino looks like. The deposit bonuses are also very good with quite low wagering requirements (35x). Usually many other cryptocurrency casinos listed also here have big bonuses, but the wagering requirements can be 40 – 45x or even more. The bonuses are available to Bitcoins and also to Altcoins (ETH, LTC and BCH) for the equivalent amount in Bitcoins. And if you prefer, you can also use FIAT currency like Euros, US Dollars or let’s say Canadian Dollars. 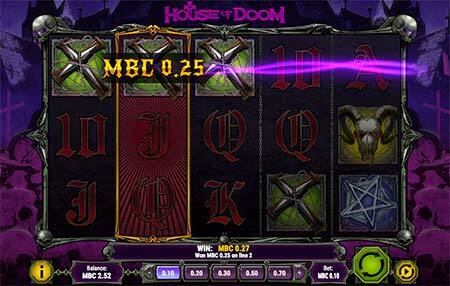 This if House of Doom 5-reel slot game from Play n’Go. In our tests the Bitcoin deposits worked fine with no extra delay. Also the customer support works well and you can get an answer via the 24/7 live chat or email. King Billy bonus codes: No King Billy bonus code is needed to get the bonuses. Just click the links from this site to get the bonuses. The casino lobby works fast, but it slows down a bit when you scroll for more casinos. 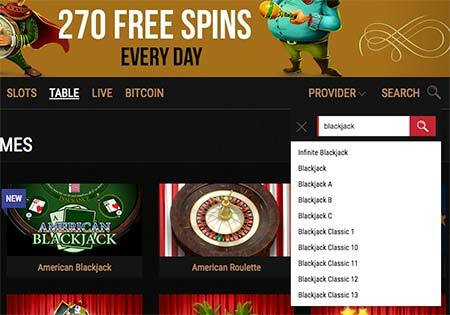 You can search the games with categories like new games, jackpot games, slots, table games, live games and Bitcoin-only games. The search function is not so good: the live results don’t update on real time. So if you want to search for example “roulette”, the results show only a list of 10 games and the casino list below doesn’t update. This could be something to improve. King Billy casino game search could be something to improve. Otherwise the casino lobby works quite fast and the information (terms, bonuses etc.) is very clearly presented. There are many language choices: English, Norwegian, Finnish, Greek, Russian, Australian (some difference in words and game choices), Canadian (English), South African (English) and German. The quality of translations (a closer look to Finnish language) is not very good quality: we have a feeling that somebody has used Google translator. There is also a VIP Club where you can earn some extra benefits. King Billy Casino is quite active in social media (Facebook, Instagram and YouTube) and there is also a King’s Blog in the site. The blog is full of special bonuses and tips to the Kingdom of King Billy. The information about bonuses and general terms & conditions are easy to find. Also the bonus information about wagering etc. is clearly presented. Well done King Billy! 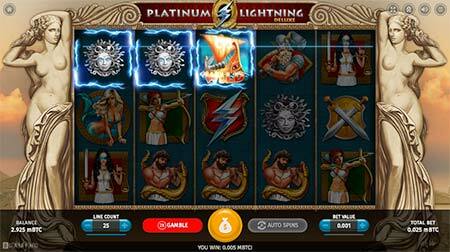 This is Platinum Lightning Deluxe slot game from casino game provider BetSoft. If you are loyal to your King, you can prove it and win some benefits in the VIP Club. The loyalty (or royalty as the casino writes it) program offers cashback and cash bonuses depending on your level. This is King Billy, the ruler of Casinia. 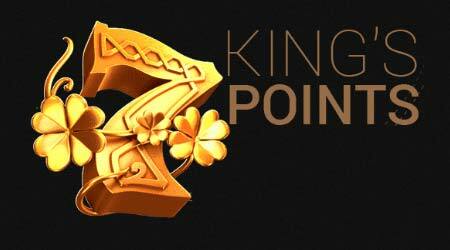 King Billy casino offers very good deposit bonuses with quite low wagering requirements (35x). Only the free spins have a bit higher wagering requirements. There are also very good extra deposit bonuses on Mondays and Thursdays. The deposit bonuses can be used in Bitcoins or other Altcoins (ETH, LTC or BCH) for the equivalent amount in Bitcoins. You can also use FIAT currency like US Dollars or Euros. First deposit bonus is 100% up to 1 BTC + 200 Free spins to Starburst and Fruit Zen (no code needed). Second deposit bonus is 50% up to 1 BTC (Bonus code: WELCOME2). Third deposit bonus is 25% up to 1.5 BTC (Bonus code: WELCOME3). 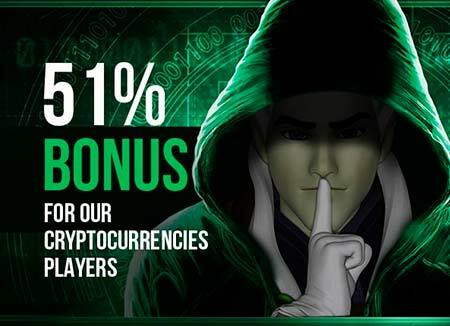 Fourth deposit bonus is 25% up to 1.5 BTC (Bonus code: WELCOME4). The total of all deposit bonuses is 5 BTC + 200 Free spins. 20 Free Spins will be credited to the player’s account every day, for a period of 10 days. The first set of Free Spins will be added to the player’s account after the player has fulfilled the wagering requirements: 1x wager of deposit’s amount in 23 hours. This is the official slot game 24 from game provider iSoftBet. There are also a lot of special bonuses besides the normal 4 first deposits. This bonus is granted only for cryptocurrencies. This bonus is available once a week. King’s Miners bonus for cryptocurrency players. 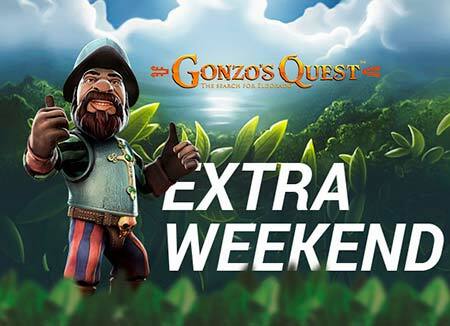 Extra Weekend bonus at King Billy casino. King’s Gift is a cashback bonus on every Thursday. You are eligible for this bonus when you reach a VIP Status of Duke/Duchess, Prince/Princess or King/Queen. 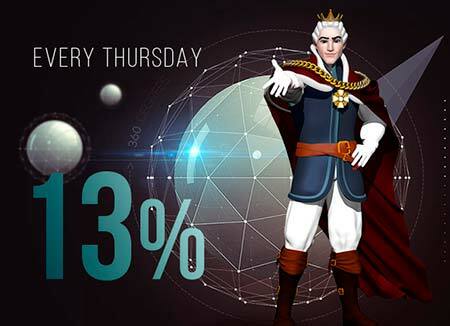 King’s Gift bonus (cashback) is granted every Thursday! Every day you get 100 Free Spins on Book of Dead / Book of Pyramids. Spin & Win bonus is available every day at King Billy. No bonus codes are needed to the first deposit bonus. Here are all other bonus codes listed. 1st deposit bonus: 100% up to 1 BTC + 200 Free spins to Starburst and Fruit Zen (no code needed). 2nd deposit bonus: 50% up to 1 BTC (Bonus code: WELCOME2). 3rd deposit bonus: 25% up to 1.5 BTC (Bonus code: WELCOME3). 4th deposit bonus: 25% up to 1.5 BTC (Bonus code: WELCOME4). King’s Miner bonus: Get bonus of 51% up to 51 mBTC (Bonus code: MINE). Extra Weekend bonus: Get the bonus of 25% up to € 100 (Bonus code: EXTRA). 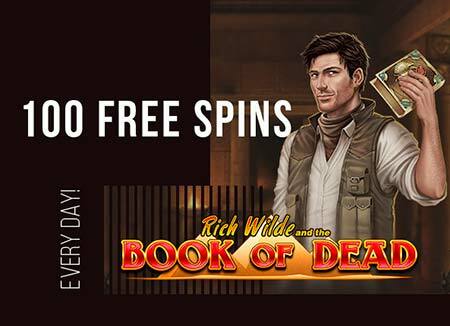 Spin & Win bonus: Every day you get 100 Free Spins on Book of Dead / Book of Pyramids. (Bonus code: SPIN). 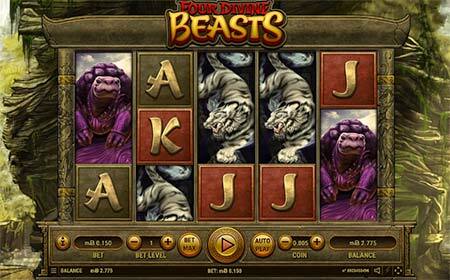 Four Divine Beasts slot game from Habanero. Right now King Billy casino doesn’t offer any free spins with no deposit. We will let you know right away if the situation changes! King Billy casino brings over 2000 casino games to choose from 18 Casino game providers. 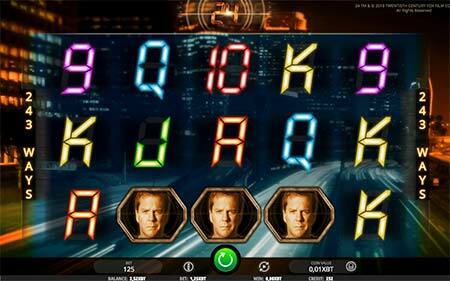 The game providers include names like Bgaming, Booming Games or Endorphina. 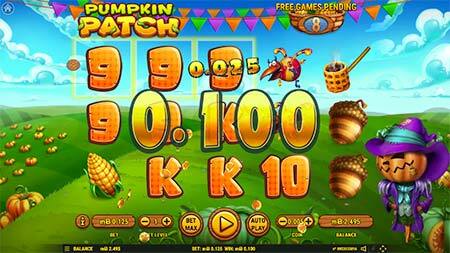 Pumpkin Patch 3-reel slot game from Habanero. All American Multihand Video Poker game is an old classic! Note that some casino game providers are not available in all countries, so the game count can be smaller in some countries. There is a very good selection of live casino games at King Billy. 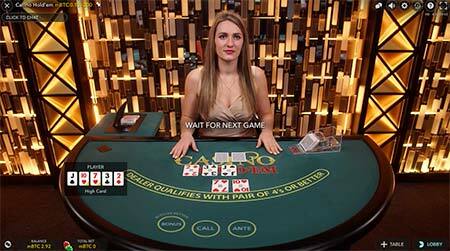 This is Casino Hold’em from Evolution Gaming. Players from UK, France, Spain, USA (or any of its states), Ukraine, Republic of Crimea, Israel, Estonia, Romania, Netherlands are not allowed to deposit and play real money games in King Billy casino. Here are the most important withdrawal and bonus terms and wagering requirements. Please read the full terms from the King Billy website. All slots contribute 100% towards the wagering requirements. Table games and video poker games contribute 5% towards the wagering requirements. Jackpots, progressive jackpots are excluded from the bonus and live dealers games contribute 0% towards the wagering requirements. In conclusion King Billy Casino is a very good hybrid casino with support to both FIAT currencies and the major cryptocurrencies. Bonuses are very good with quite low wagering requirements (35x) and you can get the bonuses also other cryptos than Bitcoins if you want. This is how the King Billy casino lobby looks like. 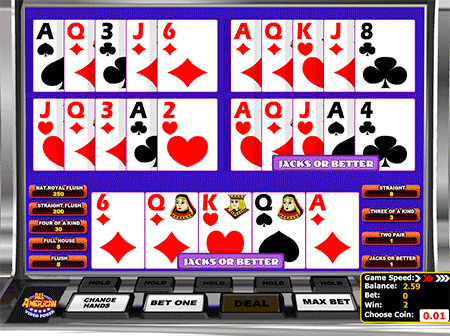 The game selection is also top notch with over 2000 names with a lot of jackpot games and live games. King Billy is quite new player in the cryptocasino field, but we see no reason why you shouldn’t try it! What do you think about King Billy casino? Please share your thoughts below. Or if you like, go here to read more about Bitcoin casino reviews.